Each year, more and more Americans suffer from symptoms associated with carpal tunnel syndrome (CTS), which is known as the fastest growing job-related problem among U.S. workers. According to the Bureau of Labor Statistics, the average number of missed days from work were highest for people with CTS (average missed work days: 27) compared to all other major job related trauma and illness. 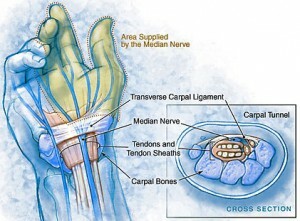 Anatomy, of the carpal tunnel (CT) is located on the ventral (under) side of the wrist. It is formed by carpal bones and connective tissue, and joins the forearm with the middle section of the deep plane of the palm. The CT contains flexor ligaments and the median nerve. CTS is a very painful and oftentimes disabling condition that occurs when the median nerve becomes entrapped and compressed due to narrowing of the tunnel. This narrowing is caused by edema of the surrounding flexor tendons or mechanical impingement (subluxation) by the carpal bones. The median nerve originates from and is formed from the median and lateral cord of the brachial plexus at C5, C6, C7, C8 and T1. It passes through the thoracic outlet and then between the two heads of the pronator teres muscle of the forearm, through the carpal tunnel and terminates in the fingers. It innervates the skin of the side of the thumb, the index and middle finger, and half of the ring finger. If inflammation, or compression occurs in any of the areas through which the median nerve passes through the carpal tunnel, it may become impinged and produce symptoms that mimic acute carpal tunnel syndrome. A sign of this may be pain in the wrist, arm and shoulder. Clinical symptoms of CTS that one may experience are numbness, paresthesias (tingling), or burning sensation in the thumb & fingers, particularly the index & middle fingers, which are affected by the median nerve; pain may be present in one or both hands extending as high as the elbow, trouble with fine finger movement and a decrease in grip strength. Difficulty performing routine tasks with the hands such as holding a cup, vacuuming, washing up or even driving; some people have difficulty holding a newspaper or a telephone. There are other diagnosis similar to CTS which are; thoracic outlet syndrome, and pronator teres syndrome. CTS also appears to be a multi-factorial morbidity; meaning its etiology (or cause) can be traumatic or non-traumatic. Traumatic CTS stems from cumulative trauma disorders, associated primarily with a repetitive motion, (for example typing). Whereas Non-Traumatic CTS cases, maybe associated with many general disorders such as hypothyroidism, obesity and diabetes mellitus. CTS has been known to complicate pregnancy and in has been the most frequent complicate in rheumatoid arthritis. Mainstream medical approaches to the management of CTS consist of prescribing medications, such as painkillers and steroid hormone injections, along with nightly splinting. This approach often disregarders natural and much safer alternatives. For instance, over the years extensive studies have been performed showing the effectiveness in low-level laser therapy in the treating of CTS. Dincer,et al., conducted a study of 100 hands of female patients with bilateral CTS. The aim of the study was to see which of the therapeutic approaches in managing patients with CTS was the most effective. Therapeutic modalities such as ultrasounds splinting and low-level laser therapy (alone and in combination) were evaluated. Researches concluded that between stand-alone and combination therapies, the combination of low-level laser therapy and splinting was superior to any other modality used. Clinical research has also validated the effectiveness of low-level laser therapy in pain and inflammation relief, two major accompanying factors to CTS. A study of 372 patients suffering from conditions ranging from rheumatic to traumatic and degenerative and complicated by pain and inflammation, were initially treated with medications and different types of lasers with a poor outcome. The use of 830nm laser achieved more substantial pain relief and improved the quality of life for those patients. Low level lasers supply energy to the body in the form of non-thermal photons of light. Light is transmitted through the skin’s layers (the dermis, epidermis and the subcutaneous tissue fat under the skin) at all wavelengths in the visible range. However, light waves in the near infrared ranges penetrate the deepest of all light waves in the visibl spectrum. When low level laser light waves penetrate deeply into the skin, they optimize the immune responses of our blood. This has both anti-inflammatory and immunostimulate effects. It is a scientific fact that light transmitted to the blood in this way has positive effects through the whole body, supplying vital oxygen and energy to every cell. Laser therapy virtually has no side effects and limited contraindications this makes it a treatment of choice for mild to moderate CTS as well as many other conditions complicated by pain and inflammation. Modern chiropractic practice use laser therapy as an affective assistant to the chiropractic adjustment. By increasing the efficiency of the correction to the problem from a different angle, which speeds up patient recovery by decreasing inflammation and improving the body’s intracellular biochemical processes. If you have any questions you may contact access health center at 310-792-5490 or to set up and appointment to get treated. ← Is Yoga Just Stretching?